In my mind Vienna marks the half way point of the journey although in reality in mileage terms it is a little more than that. Tomorrow I head on across the old Iron Curtain into Slovakia as my brother heads back to the UK. The journey from Passau to Vienna is the most popular bike path in Europe. It is easy to see why as much of it is very scenic and the surface is largely good. Add to that the fact that there are virtually no hills and it makes for pretty easy cycling. However they don't advertise the snakes in the literature, we passed a dead one at least three feet long. 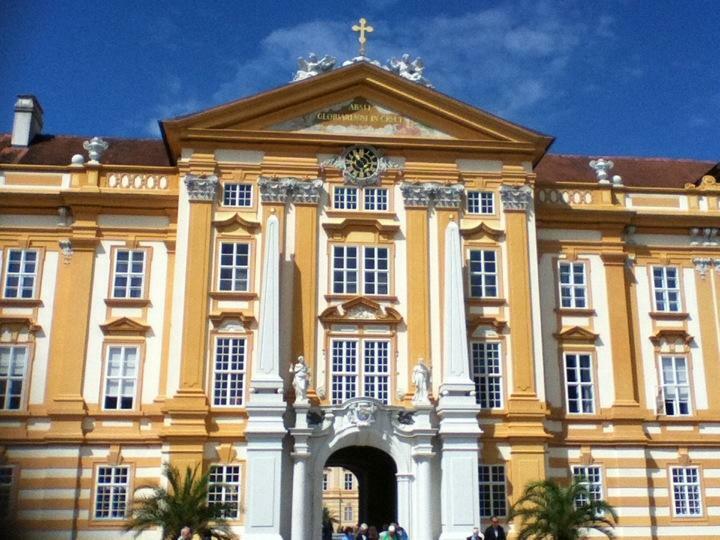 Melk is a real highlight of this part of the tour, the small town dominated by the Benedictine Monastery. Well worth a visit which is why it is the photo attached to this blog. A good restaurant too, choices other than pork veal and white asparagus! So here I sit in Vienna where everyone is commenting on how cold it is for the time of the year, rather as it seems to be in most of Europe. I was last here as a tourist as a student and recall the staff in shops and restaurants as arrogant and unfriendly. From comments from an Austrian tour guide it seems things have not changed a great deal at least in the coffee shops. Perhaps the poor service explains the large number of dictators who seem to have emerged from the city, Stalin and Hitler amongst them. Oddly enough their residence in the city didn't feature in the tour which focussed on Motzart and Freud instead. Outside Vienna I have to say the Austrians have largely been very polite and helpful if a little reserved. David Well hello.....Reynolds here. bet you never thought I would master the technology! In my mind, Austria conjures up the grape varieties indigenous to that country. Gruner Vetliner is known amongst the wine tasting fraternity as "Groovy", be sure to try some of that. My personal favourite is Blaufrankish, a robsut, if not brutal red to be enjoyed with the kind of cut a good vet could bring back. Hats off to you Andy, let the wheelskeepturning! Jenny Mottram I am sure it would be quite a different type of cycle if David joined you for some of it. Visiting a few wine taverns on route I am sure. richardf Give my regards to Dame Edna, put another shrimp on the barbie etc.